Personal statement checklist #2 Get writing - Which? 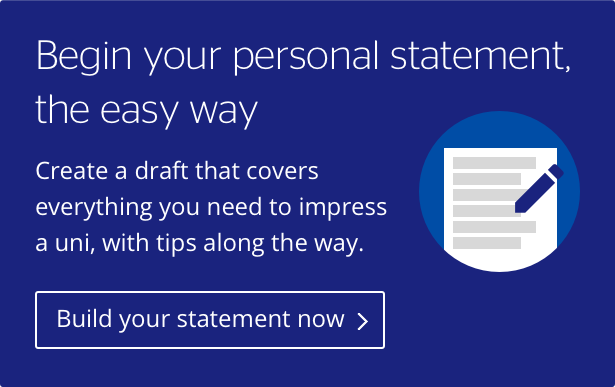 If you can’t think of anything to include in your personal statement yet, see part one of our personal statement guide for some ideas on how to get started. You might also want to see what admissions tutors have to say about making your statement stand out. Use course information on university websites or the Ucas website, or take a look through and compare course pages on Which? University, to start focusing on the specific criteria courses or professions are looking for. Your suitability to the course should form the backbone of your personal statement so, next up, gather some material from your personal experience that relates to those criteria. Then get it down on the page in any way you can. Maybe use mind-maps, spider diagrams, speech bubble or a spreadsheet. Or go for bullet point notes, or scribble things down in a long stream of consciousness, which you can cut back to the 47 line / 4,000 character limit later on. For a few pointers on what admissions tutors are looking for see our 10 things to put into your personal statement guide. Think about your studies, wider reading, extra-curricular interests, achievements or experiences that you want to put into your personal statement. If you're applying to a degree course that’s training you for a specific profession (such as social work, speech therapy, primary teaching or dentistry), it’s important to demonstrate your commitment to a career in that field and your understanding of what it involves, by giving an insight into what you’ve learned from your work experience, volunteering or any other research you’ve done. Other courses will want you to have done some in-depth research into the subject too and to be write about it reflectively. Strike a sensible balance between your academic interests and your extra-curricular ones – a 2:1 ratio, 75/25 or 80/20 would be about right, but this depends on the kind of courses you're applying for - see point two in our personal statement must-haves guide for more tips on this. How did you develop the customer care skills that made you employee of the month? How has playing hockey improved your teamwork, leadership or communication skills? How did the person you were observing handle a specific situation and how did this change your understanding? What is it that you admire about Cervantes’ novels or Katherine Dunham’s choreography? Course relevance = Making sure it's relevant to your suitability (but you don’t necessarily have to spell this out after each point – tutors can read between the lines). Don’t try and cram it all in – less is more. Don’t feel you have to stick to a formula. Don’t include anything already on the UCAS form, like what subjects you’re studying or what school or college you attend. Don’t be afraid to mention how you have overcome a disability. Don’t keep using exclamation marks! Don’t talk about the work experience you’re going to do next month – if possible, wait until you’ve done it. Don’t mention a university by name or you may upset the other four (unless you’re only applying to one). Do break up the text by using paragraphs if possible. Do try to avoid using ‘I’ at the start of each sentence. Do mention your gap year plans if applying for deferred entry. Do try to be interesting and avoid stilted vocabulary and clichés. Do pay attention to spelling and grammar. Do ask your referee to include in their reference anything you don’t have room for in your statement. Do start and finish on a positive note. Would you want a conversation with this person? Would you want this person in your seminar group? Would this person be able to defend and elaborate on what they’ve said if they’re invited to an interview? Does this person’s voice sound like yours? Hopefully, you've got four yeses! When it comes to your personal statement, one of trickiest things is knowing where to start. Here are some key tips on how to start pulling it together.